There is more data you can recover from your client's drives if you know the terrain. Let DeepSpar Data Recovery Systems show you their discovery. In 2006, we did some deep sea research on data recovery. We discovered the 3D Data Recovery Phases & Issues that became a worldwide standard for data recovery knowledge and training. Download a data sheet on 3D Data Recovery Process. Contact us for a presentation on 3D Data Recovery Causes/Process/Solutions. Read Data Loss and Hard Drive Failure: Understanding the Causes and Costs. 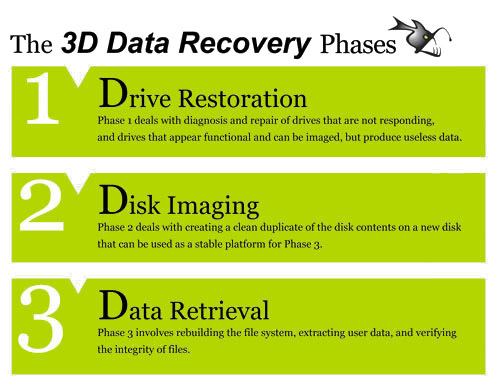 Why 3D Data Recovery Phases & Issues? We felt that the data recovery industry was in need of a structured approach to data recovery. Many companies were claiming to do "full" data recovery, but were in fact only using software processes to gather the easiest layer of available data while leaving behind, or worse, destroying, data trapped at deeper levels. We discovered the natural terrain. The 3D Data Recovery approach addresses drive-level, disk-level and data-level issues so that the maximum amount of data is retrieved. To DeepSpar Data Recovery Systems, traditional data recovery has often been done backwards – that is, starting from the wrong end. Of all the phases, Phase III, data retrieval, is the most widely performed. But on its own, Phase III is a software process that can only be successful at getting the thinnest layer of data. According to DeepSpar experts, only 20 to 30 percent of all professional data recovery cases can be addressed using Phase III techniques alone. Also, if Phase III tools are applied alone (without preceding phases such as disk imaging) the risk of losing user data increases significantly, which undermines any professional data recovery process. Phase II, disk imaging, is also widely understood to be important. But usually it is done with tools designed for good disks, not the unstable ones that often come in for recovery. The time involved and the stress placed on disks because of traditional read-intensive methods can be self-defeating if the disk fails or produces no usable data. Phase I, drive restoration, is critical for retrieving the deepest level of data from a damaged or faulty drive. Data recovery firms often do this work without proper tools, by simple trial and error, or not at all, meaning that they leave behind valuable data. Professional data recovery always starts with diagnosis of the drive and repair if necessary, progresses to disk imaging, and then (and only then) does the actual retrieval of data begin.